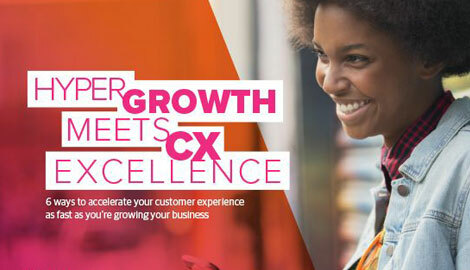 Digital and human expertise combine to supercharge the customer care experience. Digital innovations are revolutionizing the customer experience. They give customers a multitude of self-care channels and options. They automate simple and repetitive functions, allowing labor to focus on more complex and challenging tasks. And customers are open to the technology. About 69 percent of consumers are willing to use technology to get instant answers, according to research by Ubisend. But, only to a point. As complexity of an issue increases, so does customer preference for more human interaction. In fact, we’re at the forefront of an evolution in customer care that will be marked by hybrid human/AI workforces. Until recently, digital tools and services played a minimal role in customer interactions. Advances in automated technology and artificial intelligence have flipped the proverbial table.The growing presence of digital devices and services has contributed to predictions that the end of human contact centers is on the horizon. But human associates are far from obsolete. 1. To solve complex and challenging problems. These interactions require empathy and personalization during the customer experience in a way only a human can deliver. 2. Customer preference. Not all customers want to interact with self-service options or in digital channels. These customers do not want to be forced to use channels they are not comfortable with so there will always be a need to provide support to this demographic. 3. Proactively contact customers. Failing to follow up with valuable customers is a missed opportunity to deepen the customer relationship and broaden the total share of wallet. 4. An increase in (personalized) opportunities. Automation, bots, and omnichannel solutions are making it easier for customers to interact with a brand. As initial engagement barriers decrease, brands can guide and influence customer decision making with white-glove treatment. While it’s important for associates to provide a human touch, they also need the right skill set. As more simple functions become automated, associates will be expected to solve complex issues. Critical thinking, emotional intelligence, and creativity are among the essential skills that associates need to support today’s customers. However, traditional contact centers are not designed to recruit, train, or retain the types of skilled associates that companies need. Some might argue that they’re designed to do just the opposite. One of the problems is that traditional contact centers are primarily built on a culture of efficiency and micromanagement. Employees are expected to be at their workstation for 7.5 hours out of an 8.5-hour day. That is a lot of time to be tied to one’s desk except for a half-hour lunch and two 15-minute breaks. Deviations from this schedule are flagged and reported to a manager. The work is also non-stop. At best, associates have 30 to 40 seconds between customer interactions. And during peak periods they are expected to immediately take the next interaction that comes through. And if that were not enough, generally, associates are held to a handle time target, which sets a target for the amount of time they should spend on average with each customer. The industry average is between six and eight minutes. Again, outliers on this measurement are flagged for performance. This is especially amazing given that an associate must access on average 12 to 15 different (often outdated) systems to solve a customer inquiry. Associates also have limited options in what they can do for the customer and they are held to multi-point quality assurance standards. This is a list of 15 to 25 things they must do on a call to meet the company’s service standard. And they still need to resolve the customer’s inquiry. And the training is equally as limiting. Training is long (on average 4 to 6 weeks) and many times employees experience training that does not successfully prepare them for the realities of the live customer environment. Much of the reason for this is most learners do not have access to the CRM system until they start supporting live customers because there has been no investment in a mock CRM for the purposes of learning. As a result, the learning approach is theoretical. We know individuals learn better and retain more information when they are trained in a more hands-on environment where practical exercises emphasize training concepts, yet there has historically been limited progress in this area in preparing staff. As the complexity of work increases, this type of working environment is causing associates to burn out. In fact, 6.2 percent of contact center associates in the U.S. quit within the first 30 days of being hired; 5 percent left between 31 to 60 days; 5.6 percent quit within 61 to 90 days; and another 8.2 percent left within three to six months, reports Mercer. What if, instead of being bogged down by these issues, associates were given the tools they need to support customers and feel good about their jobs? What if the contact center environments were redesigned to foster collaboration and better employee engagement? What if instead of being seen as stepping stones to dream jobs, contact centers became dream jobs? • Contact centers could reduce the high occupancy environment that employees work today to allow time for employees to recharge, collaborate, and refocus to drive the optimal experience. Our ideal would be for employees, during an 8-hour day, to be in the chair supporting customers for 6 hours with 2 to 3 minutes in between each customer contact. The remaining time would be left for workplace engagement, collaboration, and self-improvement. With more time between interactions, associates could make recommendations to their leaders about how to improve the customer experience. • Investments in the technology desktop to reduce the number of screens employees have to access to resolve customer inquiries and investments in knowledge bases to make research and complex problem resolution simpler. • Training curriculums should be an area of focus. As the interactions become increasingly harder, the training to handle those interactions needs to change. There is considerable opportunity to have real hands-on training with mock CRM systems that enable trainers to train employees on real customer scenarios, so that employees emerge from training confident and experienced on how to resolve customer inquiries. • Competition for labor in markets globally is steadily increasing, savings delivered through technology will need to partially be invested in increasing employee wages to attract and retain talent needed for the future. We believe a good rule of thumb for companies to follow is that for every dollar that a company can save through automation, AI, and omnichannel capabilities, a quarter should be invested in the employee. If companies are to retain talented employees, it’s also important to create a workplace culture where employees feel valued. Digital solutions are exciting because not only do they improve operating efficiencies and reduce costs, but can help create opportunities to make these investments in our most critical asset, our people. Above all, it presents an opportunity to change the notion of contact centers as “just a job” to jobs that are ideal stimulating and rewarding work environments. A digital customer experience is the beginning—not the end—of a modern contact center where humans have an integral role to play. While some customer interactions have been replaced with self-service and automated tools, incidents that call for human intervention make it even more crucial that associates are ready to step in. When experienced and knowledgeable associates assist customers, they build trust and loyalty. This is not a war between AI and humans, but a collaboration to create ideal working environments to drive the right customer experience.